The stay was absolutely delightful. The condo was fully stocked with everything we needed. It was extremely comfortable allowing us to feel at home. The 2 bedroom unit was extremely spacious for our family of 4. Didn't have too many opportunities for interaction, but when we did, your team was kind, courteous and friendly over the phone and in person. Loved our time here on this property! Beautiful site, location and well taken care of. Thank you for adding to a wonderful vacation! 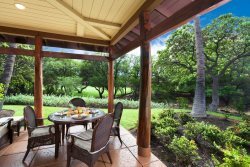 Units E1 in the Waikoloa Beach Villas was by far the best condo we have ever stayed at, and we have stayed at many. The unit was stocked with absolutely everything we could think of and then even more. Having access to the Hilton pools was a huge bonus. We also enjoyed the pool and gym at the villas. The location was great as we could walk across the street to shopping and dining and the market. We would stay here again in a heart beat and recommend it to anyone that has a family of 4 or more and needs some room to roam. We will for sure be back! The air conditioner in our condo worked OK, but was noisy due to some mechanical failure. I reported this, and within a day the problem was investigated by the maintenance staff, and a determination made that repair or replacement would be required, depending on the owner's decision. Quite amazing response. I requested that if repair or replacement would take more than a few hours, defer until after our departure. That is what happened. We really enjoyed our stay. Owner and reservation staff were fantastic. The property was just as represented. This was my first experience in staying at a resort during which I never talked to or met any representative from arrival to departure.. Everything was conducted by email and text messaging. I have to say that everything worked out well and was very efficient! But I did miss the personal interaction touch. One item we struggled with was using the key pad at the entry gate to the property. First, it was not lighted and hard to read at night. Second, we found that we had to rapidly enter the code...any hesitation or delay resulted in failured entry. By "we" I mean all those in our group. Improvements there should be a high priority. Overall, this resort and this particular unit were terrific for our needs and objectives, and a good value. We really enjoyed our stay. Very efficient and responsive to all requests and email questions. Condo entry instructions clear and worked well. Good follow-up and local office if we had concerns ... though everything went smoothly so we did not need to contact them during our stay. The condo and Hali'i Kai resort were wonderful and we enjoyed our vacation immensely! The condo was well appointed and very comfortable. The pool, grounds, ocean view and HK restaurant were great. Did not have much contact with the team as the facility was so well maintained didn't need to call on team. This unit was an end unit and was amazing, the parking was wonderful, the full views of both volcanoes were gorgeous, such well kept property. We will come again and suggest to friends. I feel like this was a great spot in the whole facility as it had the best looking landscaping and the unit we were in was so beautifully decorated. The privacy in this unit was above all and it was wonderfully quiet. The golf course was beautiful look at and fun to watch the golfers. 5th year in a row! Perfect rental experience - simple, turn key, and stress free! Will definitely be back next year (if not sooner). Mary-Anne, Emily and Kim have all been great to work with! Our property had everything we needed, it was clean, the kitchen was reasonably well stocked, and the unit easily accommodated our family. The garage had snorkel gear, boogie boards, sand toys and coolers, this helped to enhance our experience. All staff were very friendly and responsive to our concerns or questions. This was greatly appreciated.